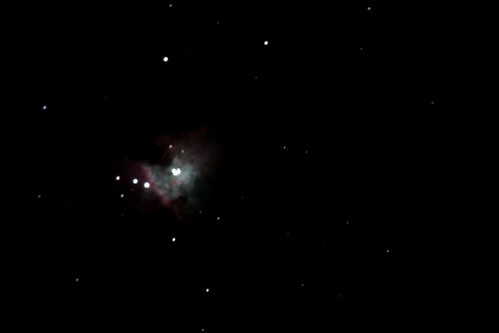 A good target for a first experiment in astrophotography in winter is the Orion Nebula at an apaprent magnitude of 4. Having acheived a reasonsble 3-star telescope alignment some quick experiments showed that 30 second exposures could be acheived without noticeable effects of star trailing, whereas at 1 minute trails were beginning to become noticeable. To achieve the image below (using 6″ Newtomian, 2x barlow and Canon 300D) I took five 30 second exposures plus a dark frame. The dark frame was removed and five frames stacked in Registax before tweaking the brightness and contrast in Gimp. This gave a pleasing result for this first imaging experiment. probably not spending long enough on the awkward exercise of polar alignment, which I think is where a lot of the tracking errors are coming from – must do better! This entry was posted in Astronomy and tagged astrophotography, Canon 300D, M42, Messier, Orion Nebula on February 27, 2011 by Jonathan.